LAS CRUCES, N.M. - They are majestic animals, weighing 400 to 500 pounds, their straight black horns 30 to 40 inches long. Their faces are adorned with distinctive black-and-white masks, and they stare at you as if deciding whether to run. The idea to provide exotic big-game hunting opportunities for local hunters originated just after World War II with Frank C. Hibben, today professor emeritus of archaeology at the University of New Mexico, but then chairman of the New Mexico Game Commission. Mustered out of the Navy in the Mediterranean, Hibben had hunted oryx in the Atlas Mountains in northwest Africa, an area that resembled his adopted state of New Mexico. Hibben believed there was a "niche" in the Chihuahuan Desert that would support a large ungulate. Years later, he paid for and helped to trap 18 oryx which, after quarantine, were shipped from Africa to New Jersey and then on to the Albuquerque Zoo. Under federal law, the original animals had to spend the rest of their lives confined at the zoo, but their offspring were released onto White Sands Missile Range, a 2.2 million-acre parcel of property. Studies conducted in the 1960s by wildlife-management scientists at New Mexico State University in Las Cruces suggested that the oryx would be successful, but nobody knew just how far they would spread - or how many problems they would cause. 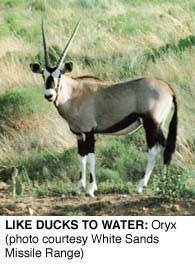 "The oryx thought this was home sweet home," says Hibben, "and they took to New Mexico like ducks to water." Between 1969 and 1973, 93 oryx were released onto the missile range - and quickly began to reproduce. Researchers believed that the population would never grow beyond 500 to 600 and would remain within the Tularosa Basin. However, the animals proved to be extremely opportunistic, and quickly spread into the San Andres Mountains. Some observers estimate the current oryx population at 5,000 or more, and animals have been spotted from 60 miles south of Albuquerque all the way down to West Texas. "Oryx do not go through a rut," says Patrick Morrow, a wildlife biologist at White Sands Missile Range. "Even in the Kalahari, they have the ability to mate and breed year round. But conditions are much harsher there, and African lions prey on them. Here, their only predator is man." "Eventually, we'd like to see no oryx outside missile range boundaries," says Patrick Mathis, area game manager at the New Mexico Game and Fish Department. "We want to decrease the herd on the range to 1,000 animals - down from 3,000. But oryx are very prolific." In 1996, in an effort to keep oryx out, the Park Service spent $1,040,000 on 67.6 miles of fencing to completely enclose the 225 square miles of the national monument. In doing so, workers inadvertently fenced in over 200 animals. The hearty oryx trampled the fragile white gypsum environment and outcompeted native wildlife for the park's sparse food resources. Park Service officials said the oryx had to go. However, when the Park Service let slip in 1998 that it was considering shooting the animals, animal-rights activists protested vehemently, forcing the agency to revert to live trapping. In a joint effort with White Sands Missile Range, New Mexico Game and Fish, and the Fish and Wildlife Service, the National Park Service spent just under $400,000 to successfully remove 228 animals. The process was exacting. Each animal had to be tranquilized with a dart from a helicopter. When the drug took effect, another helicopter swooped in with a crew that removed the dart, hobbled the oryx, blindfolded it, put it in a bag and slung it out over the monument fence. There, a processing crew measured the animal while a vet examined it and administered a reversal drug. Then the crew released the animal, where it instantly became a member of the huntable population on missile range property. Despite the mission's success, a small number of oryx - 12 to 20 animals - remain on the national monument, and Jim Mack is anxious to get them off. "We would like to implement whatever control or reduction method by this winter." The Park Service must first go to the public to solicit input on methods. Possible alternatives include: ground herding with ATVs, an alternative that may quickly be rejected because of potential environmental damage; contraception, an expensive alternative because each animal must be captured twice, once to inoculate with a contraceptive, and again to administer a booster shot; shooting, a method that brought strong objections in the recent past; or no action at all. "If we choose not to act," Mack says, "we'll have a very large number of animals in a very short time." Missile range biologist Morrow says, "In my professional opinion, this species should never have been introduced in the first place. Who knew they would breed so easily? But now that we have them, we have to manage them effectively." And what does Frank Hibben think of his oryx introduction plan nowadays? "We have more oryx in New Mexico than all of the Kalahari," he says. "I'm thrilled that they're doing so well." Robert Rowley writes from Las Cruces, New Mexico. White Sands Missile Range, public affairs, 505/678-1134.